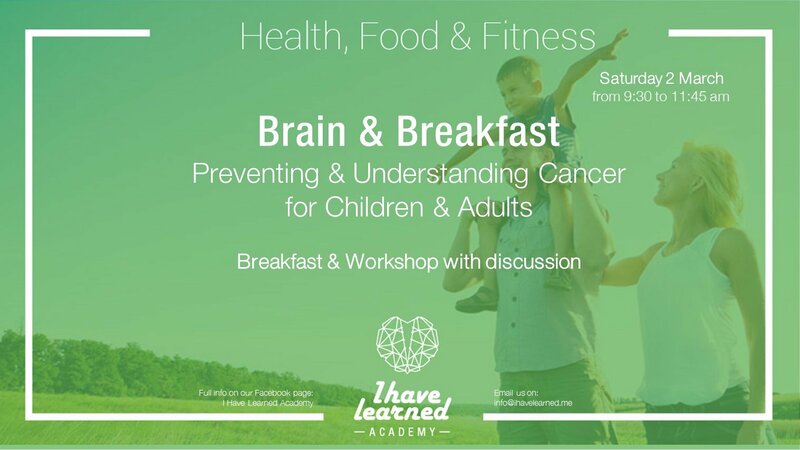 Come have a healthy delicious Breakfast and learn with us through an out of the common experience! Get to understand what cancer is and how to prevent it in individuals of all ages (Children and Adults) by getting to know multiple facts and action in a fun and new experience in Lebanon! - How to prevent cancer? Dr. Farah complete her medical degree at St Joseph University of Beirut, as well as Columbia University in New York, Albert Einstein College of Medicine in New York. And completed her fellowship in Pediatric Hematology/Oncology at the University of Texas Southwestern Medical Center in Dallas, Texas. She was selected as a chief fellow at the Children's Hospital of Dallas and worked in leukemia research and immunotherapy for two years. She is Board certified by the American Boards of Pediatrics and Pediatric Hematology/Oncology and is a Fellow of the American Academy of Pediatrics. Dr Farah is currently an Associate Professor of Pediatrics and Pediatric Hematology/Oncology at the University of Balamand/Saint-George Hospital University Medical Center in Beirut. She has several publications in the field of pediatric hematology/oncology and is an active member of several professional organizations such as the American Society of Hematology (ASH), the American Society of Pediatric Hematology/Oncology, the International Society of Pediatric Oncology (SIOP) and the International Society of Thrombosis and Hemostasis (ISTH). She served as a president of the Lebanese Pediatric Hematology/Oncology Group and is currently on the executive committees of the Lebanese Cancer Society and the Lebanese Society of Pediatrics. Her major scientific interests are: rare bleeding disorders, inherited bone marrow failure syndromes, brain tumors, leukemia, cancer genetics and familial cancers. She has received several awards for her scientific work such as a travel award from the European Association for Hemophilia and Allied Disorders (EAHAD) in 2018, from the International Society of Thrombosis and Hemostasis (ISTH) in Berlin in 2017, the International Society of Pediatric Neuro-Oncology (ISPNO) in Liverpool in 2016 and in Singapore in 2014, a special Jury Award in Amman, Jordan in 2007 for her efforts in establishing the first bone marrow failure registry for Lebanon, a travel scholarship in 2006 from the International Histiocyte Society for her contribution and work on the Syntaxin-11 gene, a travel grant from the International Society of Thrombosis and Hemostasis, Sydney, Australia in 2005 and an award for the best study on nutrition done in Lebanon. She has been a pioneer in the medical field in various disease: She described and published a novel mutation in the syntaxin-11 gene in a Lebanese family with a histiocytic disorder, several novel genes in bleeding disorders and rare anemias in Lebanon and is currently involved in important research in Europe and Canada in the Leukemia Gene Discovery Project and the inherited causes of cancer in several families in Lebanon, a very hot topic currently in Oncology. In 2002, she was touched by a child from Damour who died from his cancer cause he could not afford the cost of his care and founded CHANCE (CHildren AgaiNst CancEr) association, a non-profit-organization that supports children with cancer and serious blood disorders financially, emotionally and psychologically. CHANCE association was selected in 2015 as a top finalist for the best NGO award in health by Quality Systems International, Paris and the United Nations Development program. Since 2014, Dr Farah has been in the leadership team of Asia as a member of the Asia Regional Committee of the CCI (Childhood Cancer International), the largest global patient support and advocacy organization for childhood cancer, representing 189 organizations in 98 countries across 5 continents in their battle against childhood cancer. She was selected by local magazines in Lebanon as one of the 7 influential women of the country and as one of the “Inspirational Women in the region”. She strongly believes in family values and encourages women to find balance between career and family. She also believes in leading a healthy lifestyle promoting anti-smoking, healthy eating habits and sports and has herself participated in many running competitions and marathons and has been on podiums winning races in her age category.